We got out a bunch of his wooden trains, and we set up a game on our coffee table with some artist tape (the tape I use as a scribble strip on my mixer). I marked out two rectangles on the table, one on each end. If you roll too hard, they fall off the table. If you don’t roll hard enough, you could still knock knock ‘em into the end zone with one of your other trains. But more than that, I think it’s a good reminder of how fun it can be to mix things up in the studio. Owen and I have played “Let’s Roll the Trains Across the Floor” a bajillion times. I am thoroughly bored with that game. This new game still involves rolling trains, but there is a different objective. Are you getting a little bit bored in your studio? Maybe you can give yourself a new twist on an old theme. A new way to mix the song. Perhaps you try mixing using only EQ? Or maybe using only the faders and bus compression? Whatever it is, the more fun you have, the better your mixes will turn out. 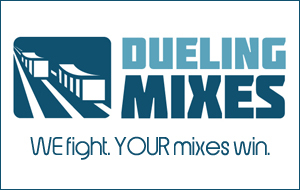 Speaking of fun, have you checked out Dueling Mixes yet? ’Tis buckets of fun.